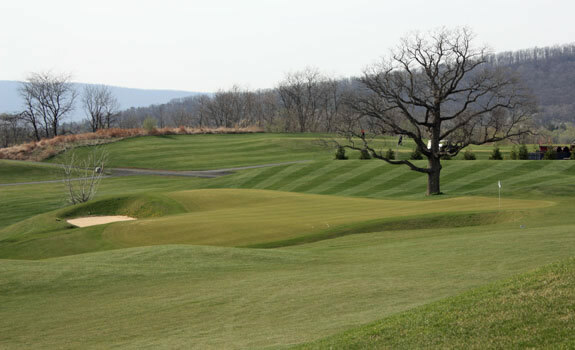 A Shenandoah Golf Experience with a Little of Everything. 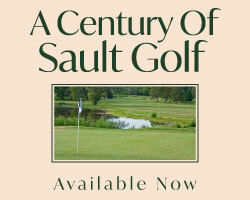 Many golfers can only dream of the chance to build their own golf course. Given his resources and a pretty varied canvas, Denny Perry set out to convert a vast track of orchards in the western edge of Winchester Virginia into a duffer's playground of grand scale. 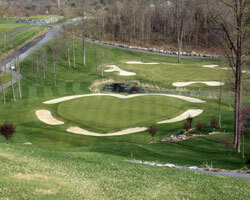 The facility is ultimately planned to be a 36 hole facility with two intertwined courses, The Rock and The Boulder, hosting rounds. Currently The Rock has all 18 holes in play, while The Boulder is a work in progress with 11 holes completed and an eclectic routing arranged to give a full 18 hole experience. The facility, a drive and chip from the interchange of Route 37 and US 50, is filled with a unique collection of design features and a high degree of challenge if you find yourself selecting the wrong set of the six available teeing options. Massive vertical drops, steep uphill approaches, an island, a heart, a double green, a waterfall and a wild variety of funky, severely sloped greens, many buttressed with rock walls all make this a golf experience you won't soon forget. With only a handful of the planned holes in circulation it was still a tough decision narrowing the field of shotmaker's gems. The routing uses a combination of 11 holes to create a brute of a challenge. Playing off the tips to a near 7600 yards, The Boulder is as tough a layout as you may find anywhere. Seven of the greens are double holed with yellow and blue flags, so when replaying a second time, alternative tees and hole positions make the shot making a different experience. A gentle opening leads to gargantuan Hole 2 / 12, a Par 5 stretching nearly 700 yards. From atop a hillside all the way to the well protected green hiding behind a pond, this is about pure length. 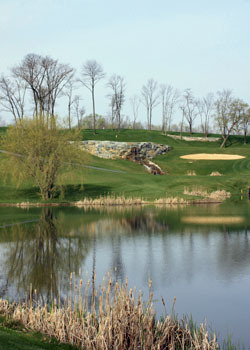 The right side of the hole is a high bank and a favorable alternative to the watery landing for anything left or short. 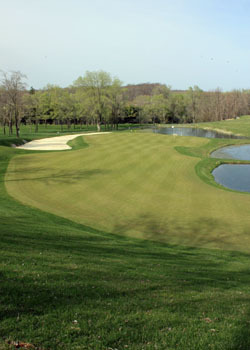 Hole 5 / 14 is a cute Par 3 with the Castle Green. The entire left part of the elevated green is faced with a thick stone wall reminiscent of a castle turret with a cascade of water pouring out. This waterfall to a fronting pond only further distracts your attention from the task. The wildly sloped green is no easy feat from either of the 2 different tee decks. The 8th / 17th is another super lengthy Par 5, where finding the back tee location might be as much fun as playing the hole. Perched on one of the highest points on the property with a gorgeous view for miles around, the target green seems a daunting task to accomplish. Faced by rock and a nearly half a football field in size, on the green in three does not guarantee your par. 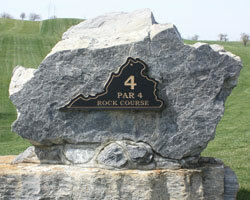 The Rock opens with a series of relatively open holes that let you see what is demanded for success. It is the holes with hidden surprises on this layout that really stand out. Number 6 is a strategic dogleg left. The tee shot is best played down the left tree line cutting back to the center. The canting fairway is the best place to attack the partially blind green. As long as you can find the short stuff, you may have a chance. The Par 5 8th is a wonderfully tactful design. The tee, perched high has OB and railway left and a high bank right. Finding the fairway gives you a choice to make. Lay up to the crossing fairway bunker and ridge or get aggressive, take aim and fly the bunker and ridge hoping to land on the blind green. The 12th starts with a challenging forced carry over water. Finding the short stuff still may not give you a look at the wickedly contoured green hidden behind exposed rock. You have to carefully plot your second avoiding the trees and exposed rock as well as the crushed stone waste area in the middle of the fairway. This is one green you need to attack gently. Every course needs a short, drivable Par 4. The 16th at the Rock is a brilliant dogleg left to a high perched green guarded by severe contours, bunkers and falloffs. 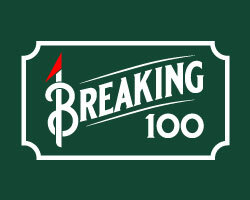 The safe bailout right may not be the most prudent play either depending on the pin sheet of the day.